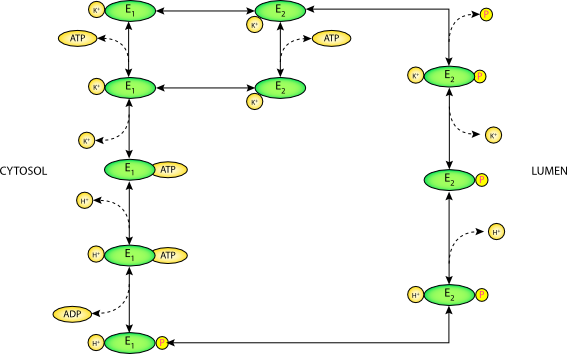 This CellML model variant describes the gastric H+/K+ ATPase. ABSTRACT: A mathematical model of the inner medullary collecting duct (IMCD) of the rat has been developed that is suitable for simulating luminal buffer titration and ammonia secretion by this nephron segment. Luminal proton secretion has been assigned to an H-K-ATPase, which has been represented by adapting the kinetic model of the gastric enzyme by Brzezinski et al. (P. Brzezinski, B. G. Malmstrom, P. Lorentzon, and B. Wallmark. Biochim. Biophys. Acta 942: 215-219, 1988). In shifting to a 2 H+:1 ATP stoichiometry, the model enzyme can acidify the tubule lumen approximately 3 pH units below that of the cytosol, when luminal K+ is in abundance. Peritubular base exit is a combination of ammonia recycling and HCO3- flux (either via Cl-/HCO3- exchange or via a Cl- channel). Ammonia recycling involves NH4(+) uptake on the Na-K-ATPase followed by diffusive NH3 exit [S. M. Wall. Am. J. Physiol. 270 (Renal Physiol. 39): F432-F439, 1996]; model calculations suggest that this is the principal mode of base exit. By virtue of this mechanism, the model also suggests that realistic elevations in peritubular K+ concentration will compromise IMCD acid secretion. Although ammonia recycling is insensitive to carbonic anhydrase (CA) inhibition, the base exit linked to HCO3- flux provides a CA-sensitive component to acid secretion. In model simulations, it is observed that increased luminal NaCl entry increases ammonia cycling but decreases peritubular Cl-/HCO3- exchange (due to increased cell Cl-). This parallel system of peritubular base exit stabilizes acid secretion in the face of variable Na+ reabsorption. Conventional rendering of the gastric H-K-ATPase model. This model has a stoichiometry of two H+ and two K+ per ATP. E1 and E2 are the cytosolic- and luminal-facing enzymes, respectively. Derived from workspace Weinstein, 1998 at changeset 7ea889840308.